“Moon Over Montgomery,” the second release produced by The McKee Brothers, once again features inspired performances by a talented roster of players from Los Angeles and Michigan, including soulful vocalists Bob Schultz (original keyboardist with Bob Seger), Jeff Robinson, Reggie Gonzales, Maxayn Lewis, Laith Al-Saadi (vocal and guitar – 2016 finalist on “The Voice”), Larry McCray (vocal and guitar), guitarist Ari Teitel, keyboardists Bobby West and Jim Alfredson (formerly with Janiva Magness and in Organissimo), horn players Lee Thornburg (formerly of Tower of Power, now touring with Joe Bonamassa) and Doug Webb (Posi-Tone Records recording artist), bassists Bobby Watson (Rufus), Al Threats, and J.V. 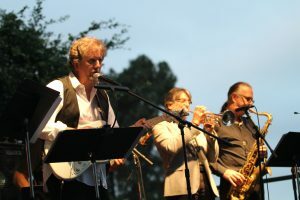 Collier (Bruce Hornsby) – as well as the brothers themselves: Denis McKee on guitar, keyboards, bass, and vocals, and Ralph McKee on bass, lap steel guitar, and vocals. 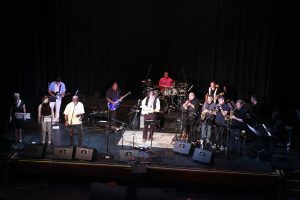 The music is high-energy and soulful, in several styles: from gospel (the inspirational title track paying tribute to the 1965 civil rights march), gritty funk (Go 2 Work!, Bayou Man, I Feel Like Dynamite, Blues of the Month Club), soul (Where You Gettin’ It?, Runaway Love, and the Latin-flavored Late At Night), jazz-blues (Kicks), to the funky country of Confidential and the rock of Remember When. Check out Laith Al-Saadi’s vocal and Larry McCray’s guitar on Worried About Tomorrow, the incendiary blues vocal by Jeff Robinson on You Know How I Lie, with smokin’ guitar by Al-Saadi, the rhythm section’s irresistible New Orleans grooves on Flat, Black, & Circular and Pigfeet, the great Lee Thornburg horn arrangement on the gospel ballad Celebrate Me Home, and some impressive guitar work throughout by Denis McKee. 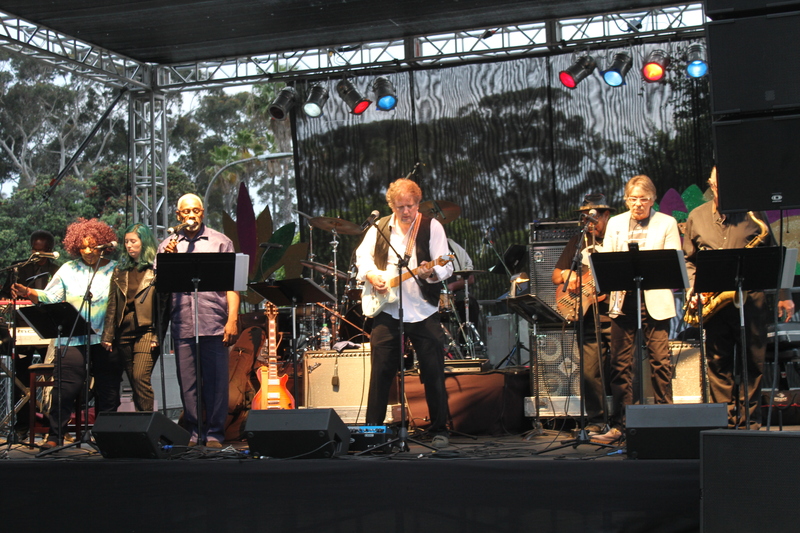 The McKee Brothers had fun performing from 7:30-9:00 on June 23rd at the Long Beach Bayou Festival. The McKee Brothers review…October 22, 2017…. The McKee Brothers, Dennis and Ralph, are back with their second high-powered release, “Moon Over Montgomery.” No sophomore slump here, as this is another strong, eclectic set that’s sure to have something for everybody. This set teams the brothers with some of the best vocalists and session players from L. A. and Michigan. 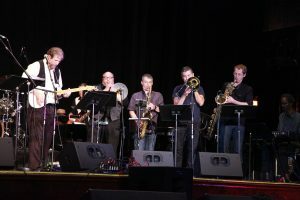 The brothers are highly-skilled multi-instrumentalists, and they are joined by thirty-plus musicians and a revolving corps of lead vocalists, giving this set a full, “big band” sound! The band hits home on a couple of hard-hitting, societal hot-button topics, and they served as our favorites. A jobless vet sounds off with a genuine fear for this country, and is “Worried About Tomorrow,” with Laith Al-Saadi on lead vocal and Larry McCray on guitar. Ari Teitel and the backing chorus add the gospel fire to the lively story of that “Moon Over Montgomery, hangin’ in a purple sky” that guided the Freedom Marchers and Rev. Dr. Martin Luther King on their march from Selma to Montgomery, AL, in 1965 during the height of the Civil Rights Movement. 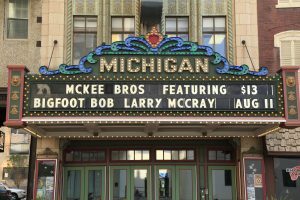 The McKee Brothers are not only world-class players in their own right, but they have joined forces with an incredible group of their friends to bring “Moon Over Montgomery” to vivid life. This is truly an excellent offering from a band rapidly making a big splash in contemporary blues! Until next time…Sheryl and Don Crow. McKEE BROTHERS/Moon Over Montgomery: How can you not want to check out a crew that finds a Carson Whitsett song pulled from some obscure Dan Penn back porch set? Funky country boys that don’t cotton to no genre lines, this bunch of extended family that knows how to pull in talent for the party from far and wide. This is back porch party stuff where the folkies like to get funky and not worry about what the baby sitter is going to cost at the end of the evening. A solid good time that turns any gathering into a fun soiree. Check it out. 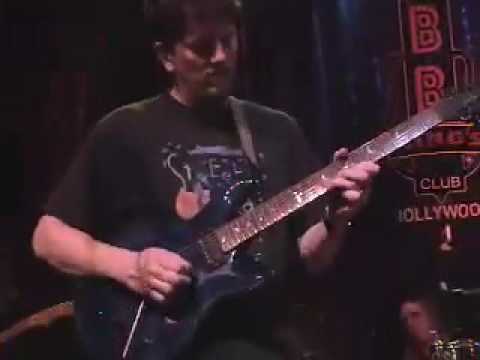 The Brother’s Denis McKee and Ralph McKee put together some high energy funky stuff! 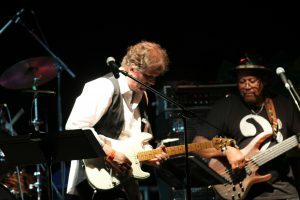 The band featured internationally known guitarist Larry McCray and the legendary Bob Schultz on vocals. Organissimo opened the night in a big way! 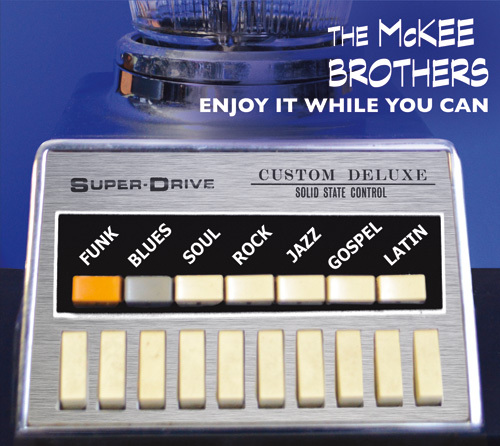 McKEE BROTHERS/Enjoy It While You Can: This one is simply going to catch you off guard and unaware. 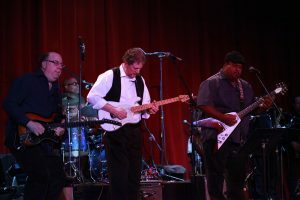 A show blues all star date, you’ve got contemporary stars here mixing it up with pros from the 60s and 70s whose chops and presence are full throttle and for real with no dust in the mix. 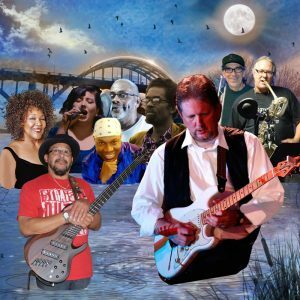 Like the show bands from the Club Manhattan have sprung back to life, this mix of soul, funk and blues is an ear opener and a sonic tonic that gets the party started and keeps it going through the week end. Killer stuff that’s fully loaded throughout. We had a lot of fun at our CD release at Necto last week. 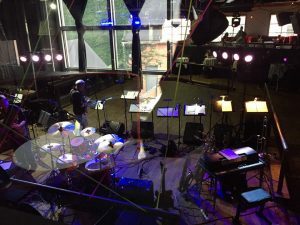 Here is a bird’s eye view of our setup before the gig. This was the 13 piece allstar band we tracked at Big Sky. We were seriously lucky to have very special guest Larry McCray on six tunes, including this one. We are lucky to have Maxayn Lewis singing on our title track “Enjoy it While You Can”. Fun session! “Enjoy It While You Can,” by the McKee Brothers, features great performances by a talented roster of players from Los Angeles and Michigan, including soulful vocalist Bob Schultz (original keyboardist with Bob Seger), guitarists Kirk Fletcher and Larry McCray, keyboardists Jim Alfredson (formerly with Janiva Magness) and Duncan McMillan, horn players Lee Thornburg (formerly of Tower of Power, now touring with Joe Bonamassa) and Doug Webb (currently touring with Stanley Clarke and his own bands), Bobby Watson (of Rufus fame) on many bass tracks, and others — as well as the brothers themselves: Denis McKee on guitar, keyboards, bass and vocals and Ralph McKee on bass and lap steel guitar. This project simply must be heard. Once you listen, “Enjoy It While You Can,” will be in your player for quite a while. Produced by The McKee Bros.